Whether it’s a quick bottle of wine on the way home, or an order for a private function, there is no better place to get your supplies than the Cellarbrations Bottle Shop at the Irish Club. Customers can select from the largest range of Beer, Wine and Spirits, and for those looking for that ‘something special’ an extensive range of imported and boutique beers and champagnes is also on offer. The Irish Club’s size enables us to obtain some of the most sought after and premium wines from Australia and the premier wine regions of the world. Weekly specials and promotions are always available, so come on in and ask our friendly staff for the best buys of the week and take advantage of our great offers and free Sausage sizzle on Friday nights. Alternatively, why not use our home deliver service. Just ring and place your order and we will deliver it to your door icy cold without even needing to leave the comfort of your home. This service is available to members of the Irish Club. Our home delivery service run’s seven days a week for your convenience. Just contact our friendly staff to place an order and we will have it on the road and to your door. From cartons of beer to bottles of fine champagne and ice or anything else we stock in-store, the home delivery service can handle the lot. Contact us: 07 47 430 677 or 07 47 432 577. Select from the largest range of wines, beers and spirits. Imported beers a speciality We take pride in being able to obtain some of the most sought after wines in Australia. Inspect our selections from the great wine growing countries of the world. The bottle shop is available to “members only” due to Queensland’s restrictive liquor laws. Members can take advantage of our home delivery service just call 4743 0677. Forget to bring your steel? We have them. 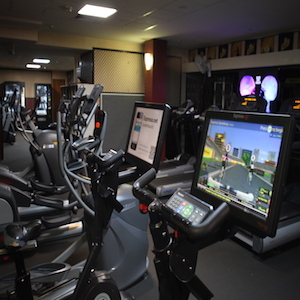 Find out what we have in our gym.